﻿Electrocardiography (ECG or EKG) is a fundamental part of cardiovascular assessment, and one of the most commonly used diagnostic tools. It is an essential tool to find the cause of unexplained chest pain or symptoms of heart disease, check effectiveness of medicines or devices like pacemakers, or simply check the heart when other conditions like high blood pressure is present. 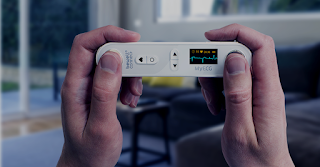 The company VISIOMED GROUP has developed a pocket-sized electrocardiogram, called MyECG. The device records the patient’s heart rate and events in real time and can identify anomalies and symptoms such as chest pain, shortness of breath and palpitations, which can be warning signs of heart disease, including angina and heart attacks. The device is small and lightweight, and simple to operate at any time, whether you are at home or on the road. It is used by placing your thumbs on the device for 30 seconds, and the results are automatically synced with the patient’s smartphone or tablet via Bluetooth. The recorded measurements are transmitted to the BewellConnect platform, an accompanying app, which also allow the patient to share its recordings with a doctor. This give the doctor the opportunity to immediately or at a later checkup to diagnose and monitor the patient’s cardiac health easily, effectively and fast. MyECG is awarded CE marking and is currently awaitng FDA-registration. It has a huge potential and won top prize in the Biotech category of the CES 2016 Innovation Awards. The innovative device and platform not only empower people to better manage their health, but also has the potential to save lives. However, as with many digital health solutions, it could become a source of stress and anxiety if not used in cooperation with a physician. An obsession to find something that may not be there. But marketed towards doctors, it can be a powerful tool to improve efficiency, as well as significantly reduce healthcare costs. It give them an opportunity to remotely assess efficacy of medicines and change dosage, form personalized treatment plans and identify who needs immediate attention. problems, and its emergency level, based on your symptoms. The BewellConnect platform also consist of several other devices, including a glucometer, thermometer, oximeter and a device to measure bloodpressure and pulse, that link up with the BewellConnect app. When abnormal data is detected from any of the devices, the app has a feature called BewellCheck-Up, a virtual doctor which generate a short series of medical questions to put the data in conext. Based on developed algorithms, the user will be proposed with a list of suspected potential problems and its emergency level. The app also include a real-time geolocation of the nearest health facilities if you are on the road, or you can use MyDoc, the in-app telemedicine platform that connects the user to an expert 24/7. Now that's service!